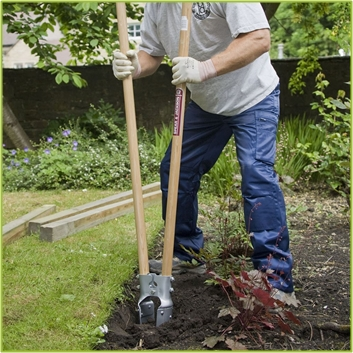 Post hole diggers are a great addition to the toolbox of anyone looking to make their garden life easier. They allow you to dig deeper with much precision compared to a shovel. Plus, they are the tools of choice if you are looking to install a fence, backyard signs, plant shrubs or trees in your garden. Before using the digger, one must check the soil, mark the spots where you want to make holes, and then moisten the soil (Source). Your post hole digger should be strong, sturdy, and have a cushioned grip for utmost comfort. To ease your search, we highlighted the best features of the best post hole diggers we have run across and what we didn’t love about it. 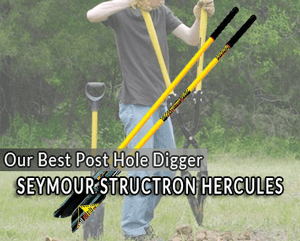 The Seymour Structron Hercules Post Hole Digger is a strong and sturdy post hole digger made for maximum strength and durability. It is professionally designed and constructed from heavy-duty materials to facilitate all garden work and dig all kinds of holes. Notably, the handle is made of bright yellow fiberglass to perhaps make it easy to identify among other tools. Alongside that, it features a cushioned and comfortable vinyl grip that allows the user to use it for extended periods without feeling fatigued as well. Moreover, it has a 6 ¼” point spread on its blades that make it a good choice for large holes. This fence post hole digger is also easy to manage and offers great maneuverability even in tough soil conditions. However, it may require more attention and effort for digging precise holes. Overall, the metal blades are sharp enough for this product to be labeled as one of the best post hole diggers for both rocky and clay soil. The Earthquake Earth Auger Post Hole Digger is the perfect choice for high digging performance. It is an efficient machine that makes your seemingly tough task super easy. The device can be operated single-handedly and can dig several holes quickly. This gas-powered post hole digger provides a strong performance; boasting a Viper 2-cycle 2HP engine with a maximum turn bit of 250 RPM. This makes it perfect for quick and easy drilling with plenty of torque, even in rocky soil. Furthermore, this product is solid and durably built for long-lasting use. It is also lightweight and weighs only 23lbs. For fatigue prevention and maximum comfort, the machine features an anti-vibration foam grip fitted in its 16-inch handle as well. Additionally, heat-treated solid steel comprise this machine’s alloy gears. It also features a 36-inch auger with a replaceable spring. To use it, you will have to mix the gas with oil in the 25-gallon translucent gas tank. Its translucent nature makes it easy to monitor the gas levels, noting when you are low on fuel. Lastly, the digger has a one-year warranty while the engine has a two-year warranty. The Bully Tools 7-Inch Post Hole Digger is a perfect post hole digger for garden tasks ranging from light to medium duties which include soft loam and clay based soil. This deep post hole digger features two-durable wood-reinforced fiberglass handles that have triple wall construction which ascertains durability. The digger’s 47” long handle reduces back strain as well as provides the needed leverage for tough outdoor conditions. Additionally, the 7-inch blade makes this tool a perfect choice for landscaping, farming, and gardening. It is made of high-quality steel that easily breaks through the densely packed garden soil. The Ames Jackson Dig EZ Post Hole Digger is the perfect post hole digger if you need one that quickly churns through the rocky and clay based soil. It is a work-horse that takes over all the tough garden work for you; hence it is perfect for digging holes for mailboxes, flowers, and fences. Its industrial-style design features 60-inches of length and an innovative make with blue fiberglass handles that protect the knuckles from common collision when in use. Moreover, this fence post pole digger also features a steel-carbon head that is 6.2 inches long for maximum soil penetration. The blades are pointed and tempered which makes it easy to dig 2 – 3.5 feet deep holes. Manufacturers offer a 90-day return policy, followed by a limited lifetime warranty, perhaps a guarantee on the product’s quality and effectiveness. If you are facing heavy duty garden tasks, consider the Xtremepower Gas Post Hole Digger. It is a beastly post digger with dependable performance and is perhaps worth every cent spent. It is the number one digging tool for all soil types, be it soft, sandy, rocky, or clay soil. 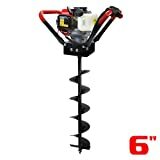 Installing fence post, planting trees, shrubs, ice fishing and installing decks are can be done easily with this powerful digger. Like most gas powered hole diggers, this product is powered by a 2-cycle single cylinder gasoline engine with 2.5HP. The engine is strong and overly reliable with a forced air-cooler which is perhaps the reason why it won’t overheat. Additionally, it is lightweight and boasts an electric ignition located on its handle for easy access and quick start-up. It generates plenty of torque for quick deep digging. On the other hand, its 2-cycle engine requires that you mix the gas in the ratio of 1:25 in the 1.5-liter gas tank. The 8-inch sharp auger bit can dig up to 3-feet deep holes with double reduction speed gears for heavy-duty digging. For ease of use, the Xtremepower Gas Post Hole Digger’s handles are sturdy and covered by a limited lifetime warranty. As mentioned before, post hole diggers come with varying features and characteristics. Therefore, to find the best product in the market, you ought to look into various factors that characterize quality post hole diggers. Outlined below are some of the top features to consider when searching for the best products on the market. Also called traditional post hole diggers, their scooping mechanism requires some muscle. They are perfect for light to medium digging for planting a tree or a small bush. They contain a pair of curved blades attached to two long handles. To use them, you have to push down into the soil as the curved blades cut through the soil. Then, lift the soil out by pulling the handles outwards and upwards. Gas post hole diggers are ideal for boring out rocky soil or larger holes. These handheld augers easily cut through the soil and even the hardest packed clay. Such diggers are made of steel and are available in varying blade widths. The wider the width, the wider the hole. Electric post hole diggers are quite similar to the gas counterparts but don’t have smelly fumes. They work well if you have a secure range power source. Compared to gas models, they are quieter but could be difficult to use in extended farms where the power source is a challenge. Like other garden tools, the best post hole digger ought to have a comfortable, strong, easy to grip, and sturdy handle. New designs should eliminate a common post hole problem like knuckle collision. Most handles are made of either fiberglass or wood. Fiberglass handles are comparably much stronger and sturdy compared to other materials. Always ensure that the blade is strong and sturdy for long usage. Thus, choose a blade depending on your intended use. For instance, pointed blades with wide tops and tapered ends are great for digging soil, hard dirt, and gravel as the pointed end can easily chisel through obstructions. On the other hand, larger blades offer more power and broader scopes. Post hole diggers are made from different materials. This could either be steel, wood, or carbon. Choosing the material also requires that you evaluate what activities you intend to engage in with. Steel post hole diggers are comparatively stronger and more reliable compared to wood diggers or other cheap metals. Nonetheless, they cost more. However, they last longer than their counterparts. Manual and automatic post hole diggers have blades or bits made of high-quality carbon steel. This gives the digger extra strength for digging into hard grounds. Automatic diggers feature interchangeable 4, 6, 8, and 12-inch auger blades for extra versatility. The final size of the hole is often determined by the diameter of the drill bit. Most drill bit diameters range from 2 – 10 inches. Making a choice should also be guided by the diameter of the posts or poles to be used. 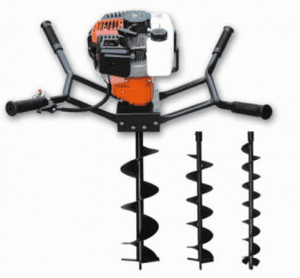 Post hole diggers are built to ease your garden work. Most models are lightweight which makes easy to use and maneuver. Lightweight models are convenient to carry around the garden or property. Like other products, warranties are important features that guarantee the quality of the product. A long warranty is what to look for when searching for post hole diggers. Any company that backs its products with a long enough warranty guarantees quality. This protects you from quality issues that could occur during manufacturing. Most companies offer one or two years while others offer a limited lifetime warranty. The best post hole diggers will make gardening activities such as planting, fencing, and hole digging much easier. There are two main types of post hole diggers on our review: the manual and gas powered. Manual models are less expensive and easier to use but slower, whereas gas powered/electric diggers are faster and much expensive. Our post hole digger review outlined above will help you make a good decision on the best digger to purchase from the market. 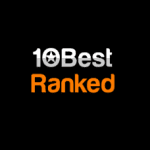 With that said, have you tried any of the models we’ve mentioned above? Which is your favorite manual and gas/electric model? Share with us below!